As I explore the background literature on taste perception, I try to read deeply rather than broadly. Most recently, I read a batch of papers about taste coding in the brainstem. Taste information goes from taste bud cells on the tongue to the nucleus of the solitary tract (NST) in the brainstem, then to the parabrachial nucleus (PBN), and then the thalamus and onward (in primates, taste info does not travel via the PBN). A few labs have recorded from these areas in primates and rats, most notably David V Smith. Today I'm going to briefly describe one of his papers, and why it left me unsatisfied. A couple posts ago, I described how the arcuate nucleus of the hypothalamus regulates feeding. The arcuate nucleus does not directly project to any taste areas, but does project to the lateral hypothalamus, which then projects to NST and PBN. In today's paper, Cho et al recorded from NST while stimulating the lateral hypothalamus. They recorded 99 taste responsive neurons in NST via glass micropipette (they do not say how many total neurons they recorded form). To stimulate LH, they simply stuck an electrode in there, and stimulated with square pulses at 0.33 Hz. 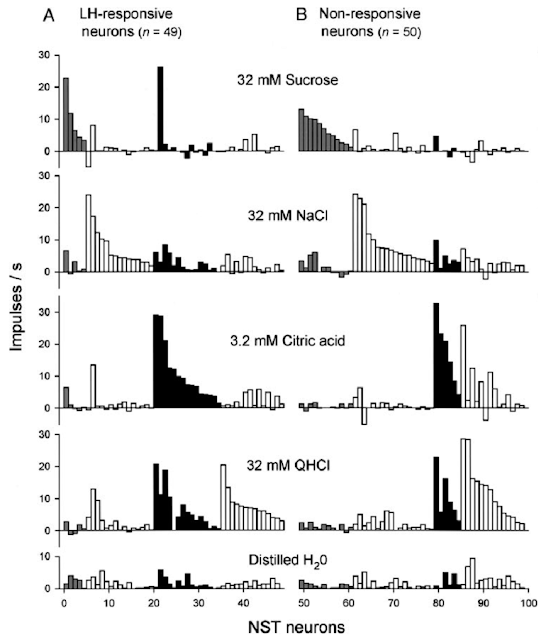 Approximately half (49/99) of the taste-sensitive NST neurons responded orthodromically to LH stimulation. The taste receptive fields and LH sensitivity were distributed across all taste modalities. Taste responses of LH-responsive and non-responsive neurons. All taste modalities are represented in both groups. From Cho et al, 2002. Of the hypothalamic stimulation responses, a majority were excitatory (43/49), while the rest were inhibitory. Only two neurons responded antidromically to stimulation. To rule out fibres of passage, they applied a glutamate agonist in the LH, and saw it could still affect the NST. Finally, they stimulated the LH while applying tastes, and found that the combination caused more firing than a tastant alone. This is not surprising given a majority of LH input was excitatory. This is still a state-of-the-art experiment for recordings from NST, so why is it disappointing? In the age of molecular mouse models, electrical stimulation is antiquated. There are multiple cell types in the LH, and stimulating all of them is just too dirty. This seven year old paper is already outmoded. It reminds me of old movie comedies, like The Pink Panther. My dad loves those movies, and as a kid I liked them too. But if you watch them now, they are predictable, obvious. Most papers inevitably turn pink, as we stand on giants' shoulders. New methods outdate the old, and people are just more thorough now. More famous examples of Pink Panthers would be the early papers in LTP by all the big bears like Malenka, Malinow, Kauer, etc., where they applied a few antagonists and called it a Science paper. Other old papers still hold up in a timeless way, like Fat and Katz, or Hubel and Wiesel. While they're simple, and have been surpassed technically, the core result is still clean. We still describe visual cortical neurons in terms of orientation selectivity. These are the Some Like it Hots and Airplane!s of neuroscience. The Pink Panthers deserve a large, hospitable wing of the Annals of Underwhelming papers, where they can live out their senescence. I am going to read all of David V Smith's papers, and take from them what I can. And hopefully outdo them. * As always, my disappointment in a paper should not reflect on the scientists who performed the experiments. Nor do these opinions reflect those of the lab.